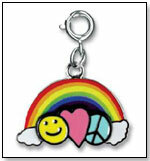 Other products from HIGH INTENCITY CORP.
A winning design from High Intencity's Design-A-Charm contest, the Peace Love and Happiness charm was designed by Emily R. from Pleasantville, NY and rendered in vibrant detail in an enamel charm measuring approximately one inch.10 % of the proceeds from the sale of this charm will go to the World Wildlife Fund on behalf of its designer. — “Charm It! works really well in this area,” said Blanche Snipes, owner of Tree Top Toys in Redmond, Wash., when asked about her top-selling items for tweens. — Two of 44 retailers listed Charm It! as a best-selling item for tweens during a September 2010 survey. — Katie Rook, manager of Be Beep A Toy Shop in Columbia, S.C., told TDmonthly in an October 2011 survey that High Intencity charm bracelets are their best selling tween item. — Dean Smith, owner of JaZams in Princeton, N.J., told TDmonthly in a Summer 2012 survey that they sell between 40 and 50 Charm It! charms each month. 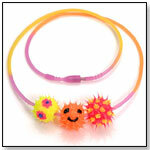 Kooky Beadz™, patent pending, are fun, wacky, spiky, silicone beadz that can slip on and off colorful silicone necklaces with ease, as quickly as you can change your mind. Mix and match them to suit your mood and personality. You can create necklaces, bracelets and more. This Iridescent Butterfly Necklace features white and purple iridescent paper butterflies that hang on adjustable pink and purple cords. The penguin on this necklace glows in the dark and is available in assorted colors (purple, turqouise, blue, and green). The neon cord reflects black light, displaying rainbow gradients. The satin rainbow cord also comes with an adjustable back and two silver balls to complement the penguin pendant. Available in an assorted dozen for retail, the Rhinestone Key Necklace features either clear or multi-colored rhinestones. Each pendant hangs on an adjustable silver ball chain. This Mood Tooth/Claw Necklace features a pendant that hangs from an adjustable wax cord. Each necklace also has two mood beads on it, which change colors when touched or worn. Each pendant hangs on a "Mood Jewelry" retail header tag, which will define the meanings of each color the mood material turns. Screen with words that have many different sayings. Over 20 different words, these are in tie dye or solid color colors and they glow in the dark. Charm Candy comes complete in individual bakery boxes that reveal an unexpected treat, real bakable (and reusable) cupcake liners and necklaces with retro-reminiscent bubble heart pendants. For a little icing on the cake, each bakery box features a Surprise Cupcake recipe on the back to inspire custom confections. — In a September 2010 TDmonthly survey, two of 44 retailers named Charm It! charms a top-selling jewelry and accessory item. This set includes two hair accessories in pastel colors, each decorated with a heart-print bow. Pink, lavender and blue headbands are available. — In early fall 2010, 11 percent of 44 retailers surveyed told TDmonthly Pink Poppy is a best-selling jewelry and accessory brand. This 24-pack features Silly Bandz resembling the popular Hello Kitty character and her accessories, including a hair bow and an apple. These bands can be collected, worn or traded with friends. — 14 percent of 44 specialty retailers named rubber band bracelets a top-selling accessory in a fall 2010 TDmonthly survey, with one retailer boasting sales of 4000 a month. These children's watches have flexible plastic bands and measure 8" long. Each watch has a battery tab and is packaged in a peggable plastic box. — In early fall 2010, seven of 44 retailers named children’s watches a jewelry and accessory best seller. Two cited Toysmith as a top brand. — Mary Porter Green, owner of Curiosity Zone in Ashburn, Va., told TDmonthly in September 2010 that her store sells “at least a dozen” children’s plastic watches each month. “Parents want their kids to be able to tell time,” allows Gwen Bowden, manager of Doodlehopper for Kids in Springfield, Va. 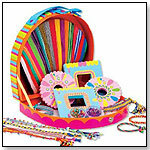 This Assorted Woven Bracelets Display offers easy sales and great margins. Each display package comes with 144 pieces of assorted woven bracelets and comes with a free display. Each bracelet is tagged individually with a UPC barcode (022902752481), for quick and easy display. This two sided pendant comes by the dozen and hangs from a 24" silver ball chain. One side reads "Save the Planet" and has the Earth on it. The other side of this Mood Peace Sign Key Necklace reads "Key to Peace" and has a peace sign on it. Both sides are "mood" sensitive, and change colors to reveal your inner mood when touched or worn. These Silver Beaded Woven bracelets are new to the Cool Jewels ® line. Each dozen comes assorted in a variety of colors: pink, blue, purple and green. Silver beads shine throughout this adjustable slider bracelet. Kids can personalize their sneakers with these durable shoelace attachments for collecting, trading and wearing. Children can spell out their name or personalize their shoes and sneakers with the eye catching, colorful letters and generic images. This Halloween-themed Silly Bandz 24-pack includes Jack-O-Lanterns, Bats, Frankensteins, Spiders, Witches and Ghosts. These bands can be collected, worn or traded with friends. — In late summer 2010, 10 of 43 retailers surveyed named rubber band bracelets an overall top seller. — Casey Sartain, buyer for Tutoring Toy in Salt Lake City, Utah, told TDmonthly in August 2010 that the store sells about 100 packs of Silly Bandz each month. Wear one and share one. This best friends dolphin necklace comes assorted in three colors: purple, pink, and light blue. Each set comes with two necklaces. One dolphin pendant reads “best” and the other “friend.” Necklaces are adjustable. These adjustable sliders can be worn on ankles or wrists. Each bracelet / anklet is made with colorful dolphins or turtles, and "bell" beads which quietly jingle with movement when worn. Comes prepacked with a free compact counter display (for retailers) and is individually UPC'ed. This Black Shark Tooth Necklace features an exact replica of a 22 million year old shark tooth made with incredible accuracy and detail. Each tooth is wrapped with stainless steel wire, and hangs on an all-natural rope cord necklace. This Mood Turtle Necklace features a turtle pendant which hangs on an 18" adjustable silver chain necklace. Each Mood Necklace comes with a "Mood Jewelry" header tag which describes the meaning of each color. 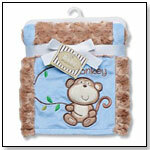 This super-soft, machine-washable luxury blanket is made of quality fabric with a whimsical jungle print and applique. It offers two different fabrics and textures on either side, and boasts a generous 30" x 40" size. Other colors and blanket designs are available. 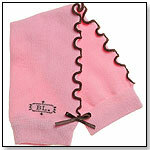 This blanket is a luxurious two-ply 30" x 40" plush blanket with a heart applique and ruffle trim. A coordinating Snuggle Buddy is also available. "The fabric is unlike traditional blanket fabrics," Danielle Signorelli, Media & Communications Director of Rashti & Rashti, told TDmonthly.